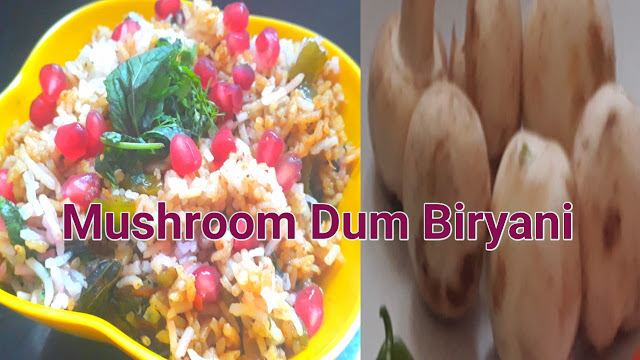 pulao, how to make dum biryani, these all questions when comes in your mind then see the recipe of Mushroom Dum Biryani Recipe here on vegkatta. Believe me it becomes so yum when you follow the steps as I mentioned here. This mushroom dum biryani becomes very delicious. When some guests came to your home then you can impress them by serving them this type of Mushroom Dum Biryani. 1. Wash and boil rice in water. 2. In same water add 1/2 of khada masala while boiling rice. 3. Add 1 tsp of salt in water. 4. Add 1 tsp of oil in water. 5. Cook the rice 80 %. 7. In a kadhai add 60 gm butter and 1 tbsp of oil. 8. Add remaining khada masala in butter. 9. Stir it for few seconds. 10. Add ginger and garlic paste in it stir it well. 11. Add chopped onion in it mix well. 12. Add chopped tomatoes and cook it till it comes in paste form by adding rice water step by step. 13. Add pulao masala and pav bhaji masala in it and mix it well. 14. Add turmeric powder and red chili powder, salt in it and cook for few minutes. 15. Now add chopped shimla mirch and mushrooms in it and again add rice water and cook it well. 16. Now keep it aside. 17. Take another pan add butter in it. 18. Spread the butter now add veggies layer at the bottom. 19. Now add cooked rice's layer on it. 20. Now spread coriander and mint leaves on it. 21. Sprinkle some pomegranate seeds on it. 23. Do the process again. 23. At top pour rose syrup instead of food color on top. 24. Cover it and cook for 2 minutes. 25. Biryani is ready to serve.